I'm excited about the work I'm making right now. The process is very circumstantial, and I am enjoying the peace that comes from making wabi-sabi, material centric, hands-off-the-damn-panel type of work. 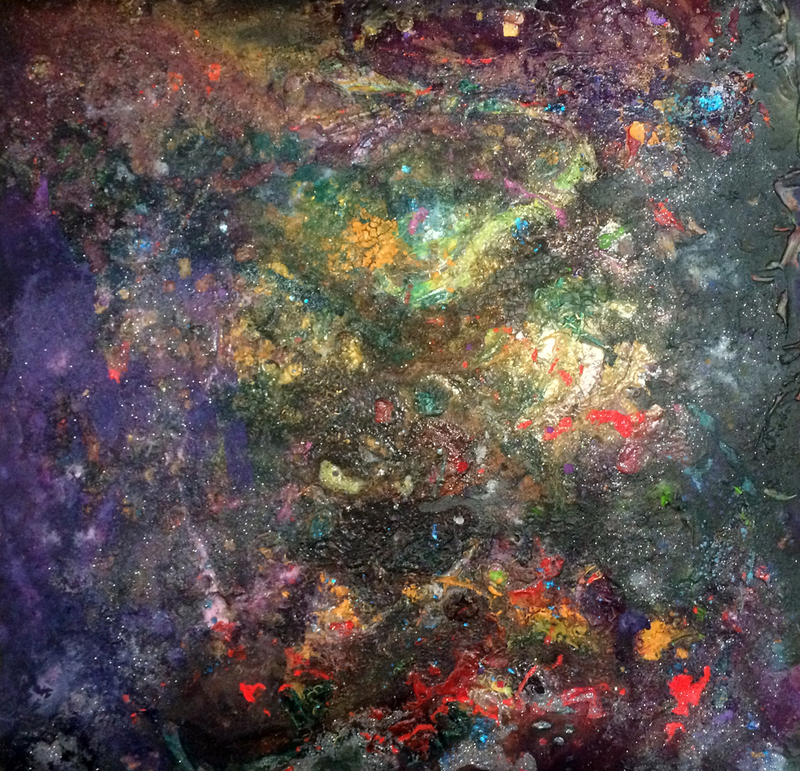 I'm doing a lot of pouring, spraying, and squeezing paint directly onto the surface. I'm mixing powders, mediums, glue, and glitter. I'm using materials in the 'wrong' way and it feels pretty good. Though a small rebellion, a very satisfying one. Is this a map of your mind? I am creating process where the product is unknown. I leave my studio with materials pooling and swirling, coming back with no idea what I will find. It is life imitating art imitating life. There is a reckless irreverence that I am practicing--which comes in handy during times of uncertainty. I thought I was making work about the galaxy in drag, but now I'm not so sure. The fearlessness I'm channeling is certainly inspired by the performers I idolize, but I'm starting to wonder if the work is more an exploration of an inner landscape, the infinite universe of the mind. I think there are quite a few similarities between outer space and the brain. For me, the terrain of the universal mind embodies a mysterious intrigue, a vastness beyond understanding, and the personalization of cosmic perspective. So theres more to explore, and more to come. Next week is February break and I'm armed with a gallon of elmers glue, two jugs of acrylic medium, a rainbow of glittery liquid watercolor, and a school-size economy set of tempera paint. It's going to be a wild staycation. My wishes of wax were answered. 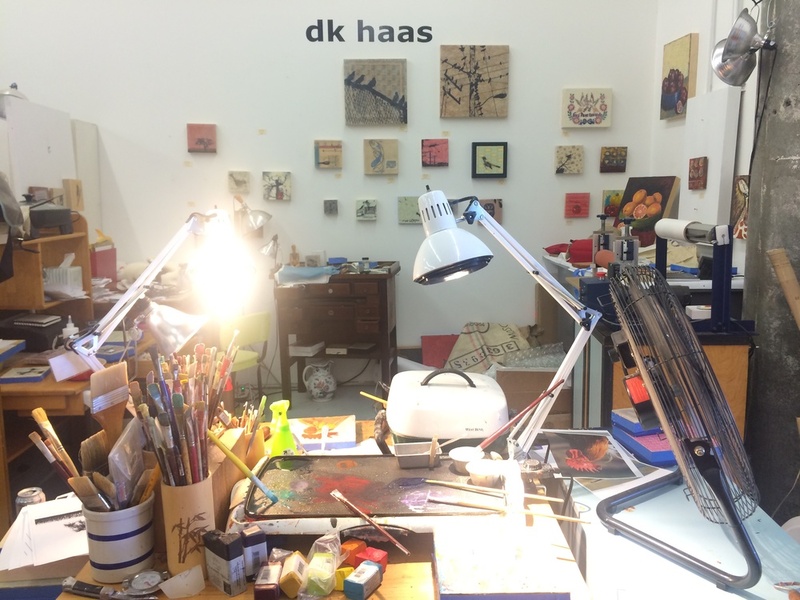 Due to a twist of events that included forgetting my studio keys, I got to have a studio visit and encaustic tutorial with dk haas. dk's studio is great and her wax set up is dialed in. She's been working in wax for a decade. I got to play with pigment, a heat gun, paraffin and beeswax, falling completely back in love with the swirling liquid wax. I think there's lot of potential for universe-in-drag work with this technique. All I need is a little glitter. San Francisco's iconic Drag Queens are the primary inspiration for my current work. The 'spark that was to flare' into the Is Glitter Gay series was struck at Fall Follies 2014. The show, chock full of incredibly talented performers, was hosted by Cookie Dough. It was the first time I had seen Cookie on stage and I immediately loved her. I loved her yellow and black plaid schoolgirl ensemble, a la Cher Horowitz. I loved her irreverence and personable honesty. I left the show a Cookie Dough Fan. At Christmas, Erica and I went to the Golden Girls and lined up after the show to have our photo taken with the cast. Cookie, fantastic as Sophia, was such a delight. She complimented my sweater and remembered my name. I was too starstruck to tell her I was a big fan. My heart is heavy with the news of Cookie's passing. Though I can't count Cookie as a friend, or even an acquaintance, she made an impression on my life and my art. As my newest work begins to marry the celestial and the glamourous, I imagine Cookie's New Home, beyond this world. My thoughts are with Cookie's family and friends. My final project in Painting II, taken during my senior year at college, can best be described as a contraption. 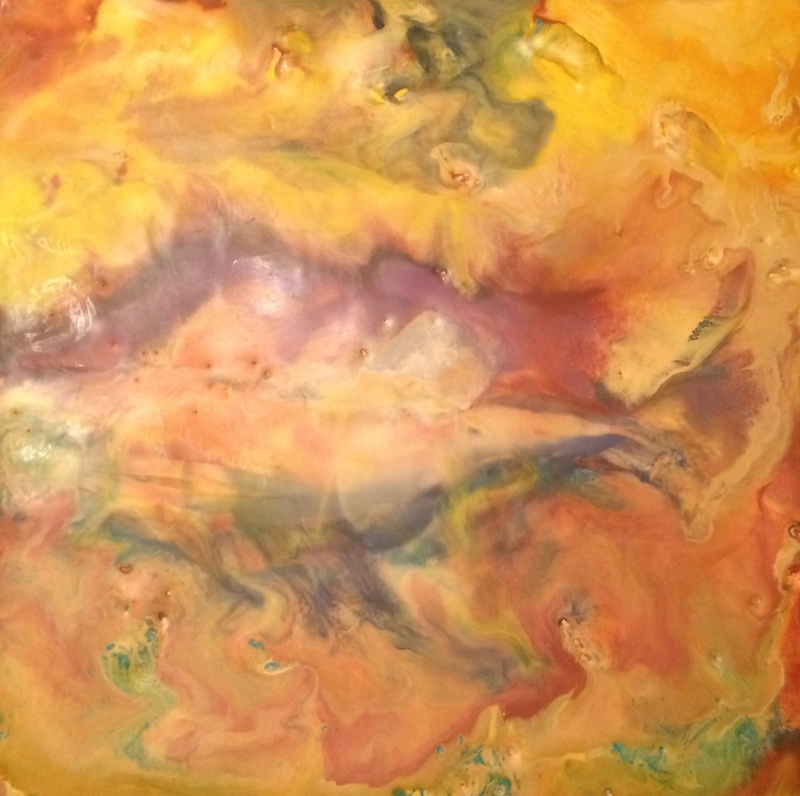 I had been working a lot with wax and loved the way the liquid wax pooled and swirled before it cooled. So I fashioned a chute out of plexi and leaned it against a stack of cardboard boxes and proceeded to pour hot wax down the slide onto the surface below. My professor walked into the studio and declared that the contraption was my final project. This surprised me since I thought it was a pile of junk I was using to MAKE art, and he thought it WAS the art. And here we come full circle. I'm feeling drawn to go back to wax again. My current work explores the tension betweens a hands-on and a hands-off approach, so the resurrection of the wax contraption came to mind. But this time I'm going to make it like a piece of art, or at least not like a pile of junk. I still intend to use it to make pieces for the wall, but hey you never know. Today I made a model of Wax Contraption 2.0. Life sized version coming soon.